Hillhaven Nursing Center is a private family-owned-and-operated facility in Adelphi, Maryland that maintains 66 certified beds. Services at this facility include assisted living, respite and rehabilitation services, and hospice care. With a total of 55 residents at the last official count, Hillhaven is relatively cozy compared with the Maryland and U.S. averages (about 107 residents at the average Maryland nursing home; about 86 residents at all nursing homes across the country). We are nursing home lawyers. We have a bias against elder care facilities - particularly for-profit nursing homes this one -- that probably comes across in the reviews we do. We see nursing malpractice in Maryland's best nursing home and Maryland's worst nursing homes. That said, Hillhaven appears to be an excellent nursing home. Hillhaven has been family-owned and run since 1978, when it was an 18-bed facility. It has remained the concern of the same family ever since, while growing to 66 beds. The company president and administrator, of the same family, is a registered nurse. All four children of the main owners serve in some important capacity at this facility, and one of them, too, is a registered nurse. "Throughout the years," the Hillhaven website says, "they have all held various positions giving them a unique perspective and knowledge of senior living." It's not every day that we find a nursing home that has been "in the family" for decades, in which those holding top positions of responsibility literally grew up learning how to do their jobs. Implicit is the idea that the members of this close-knit organization know their business. And everything that management does for the good of the facility is also for the good of the family. Says the facility website: "A smaller family-owned and operated community means more personalized care and dedication to your needs." Every nursing home says something like that. This one seems to be backing it up. Hillhaven has a history of deficiency-free surveys and 5-star ratings from Medicare. Riderwood Village: Imagine getting three A's and a B on your report card but coming in behind someone who got straight A's. Hillhaven got three 5-star ratings and one 4-star score, but Riderwood Village got 5 stars across the board. Based on its scores, Riderwood Village is one of the best facilities in the entire country. But then again, so is Hillhaven. And these two facilities are less than two miles apart. Woodside Center: This Silver Spring facility is truly a competitor to Hillhaven -- quite an achievement, since Hillhaven's Medicare scores are so high. Both facilities got the top 5-star rating overall. Sacred Heart Home Inc.: Sacred Heart Home's main Medicare scores are identical to those of Woodside Center, so it also represents real competition for Hillhaven. The difference is that Sacred Heart and Hillhaven are located so close to each other that one could almost do a side-by-side comparison. Manorcare Health Services - Hyattsville: Based on its main Medicare ratings, this Hyattsville facility is solidly above average. Hillhaven beats it in the overall Medicare rating (5 stars to 4 stars) but this Manorcare facility topped Hillhaven (5 stars to 4 stars) in the important category of quality measures. Crescent Cities Center: Another solidly above-average performer, Crescent Cities Center in Riverdale is a runner-up to Hillhaven in terms of the Medicare ratings - except for its health inspection, which netted a below-average 2-star rating (versus Hillhaven's 5 stars). St. Thomas More Medical Complex: Like Crescent Cities Center, this Hyattsville facility finishes second to Hillhaven in terms of the Medicare scores, and a distant second in terms of nurse staffing (with a 2-star rating, to Hillhaven's five stars). Fox Chase Rehabilitation & Nursing Center: Fox Chase, in Silver Spring, got main Medicare scores identical to those of St. Thomas More, and falls similarly behind Hillhaven in the same categories. NMS Healthcare of Springbrook, LLC: Compared with Hillhaven, this Silver Spring facility is a sub-par performer. Somehow NMS Healthcare outscores Hillhaven on quality measures (5 stars to 4 stars) but its overall Medicare rating is two stars. Althea Woodland Nursing Home: Hillhaven has some very serious competitors nearby, but Althea Woodland is not one of them. This Silver Spring facility scores below (or much below) Hillhaven in all four main Medicare rating categories, including its overall 2-star (below average) rating, in contrast to Hillhaven's 5 stars. Sligo Creek Center: Of all the nursing homes within two miles of Hillhaven (and there happen to be 11 of them), Sligo Creek Center in Takoma Park gets the rock-bottom worst Medicare scores, very much in contrast to Hillhaven's near-perfect Medicare ratings. Hillhaven's last standard Medicare survey, in May of 2016, earned this facility a top 5-star rating for its health inspection. The total of two deficiencies inspectors found here was well below the Maryland and U.S. nursing home averages (11.5 deficiencies across Maryland, 7.2 deficiencies on average, nationally). Consistent with this facility's claims of ongoing quality, Hillhaven has had no Medicare complaint inspections since at least November 1, 2015, and it has had no federal fines or payment denials in the last three years. Hillhaven also got the top 5-star Medicare rating for staffing. The total time per day that Hillhaven residents got with nurse staffers exceeded the Maryland and U.S. averages by over half an hour. Most notably, residents here got much more daily attention from registered nurses: about 40 to 50 minutes more per day than the state and national averages. Because registered nurses are the lead caregivers, Medicare gives the RN category its own rating; Hillhaven got 5 stars. (As noted above, RN care runs in the family, starting with the chief administrator.) This facility was slightly below average in the time residents got with physical therapists and LPNs and LVNs (licensed practical nurses, licensed vocational nurses), but it was extremely generous in the time it gave residents with CNAs (certified nursing assistants): nearly four hours per day, well over an hour more than the Maryland and U.S. averages. Given its statistical record, we find it a bit hard to understand how Hillhaven got only a 4-star rating for Medicare's quality measures, which are numerical gauges of the types and amounts of care residents receive. Hillhaven scored better than the Maryland and U.S. averages in eight out of nine categories applicable to short-stay residents. The short-stayers at this facility were significantly less likely to report having serious pain. Notably, none of them had issues with pressure ulcers (bed sores). The rate of successful discharges at Hillhaven was better than the state and national norms, and, once discharged, former residents were less likely to need rehospitalization or an ER visit. The stats related to Hillhaven's long-term residents do raise some issues, but this facility did outscore the Maryland and U.S. averages in 11 of 15 categories. What does a facility have to do to get 5 stars? Long-term residents at this facility were slightly more prone than average to have urinary tract infections, incontinence, or serious pain; they definitely were more likely to need help in conducting their daily activities. The most negative stat for long-stay residents at this facility was in its use of physical restraints: at 2 percent, this figure was about three times the state and national averages. But since this facility had only 55 residents at the last official tally, the figures suggest that they used physical restraints in only a single case. To turn to the positives (of which there were quite a few), long-stay residents here were more likely than average to maintain their mobility and healthy weight levels; they were less than half as likely to suffer depressive symptoms, and they were less apt to need antianxiety or antipsychotic meds. All (or nearly all) got flu and pneumonia vaccinations. Most prominent in the statistical record: long-stayers here were less than a third as likely as the state and national averages to have a pressure ulcer (only 1.8 percent here) and about one-sixth as likely to hurt themselves in a fall. Interestingly, of the few Internet complaints we saw, there was a complaint about failure to protect against fall risk. The statistics do tell another story. Either the report is false or, as we always say, nursing home negligence happens even in great nursing homes. This array of stats sounds like Hillhaven has been taking pretty good care of its long-stay residents - the way it feeds them, gives them preventive shots, keeps them free of bed sores, and, apparently, enables them to stay in good spirits. So, again: what more does it take to get the 5-star rating for quality measures? We don't know. But we suspect that if Hillhaven remains a family enterprise that keeps adding to its decades of experience, there will be ample opportunities for this facility to get more 5-star ratings in future. 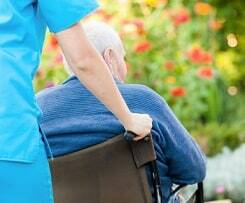 Has a ManorCare nursing home made an error that ended in a completely unnecessary tragedy? We can help navigate Prince George's legal system, give you your legal options. We fight for justice and compensation for you. We have a track record of success. Our legal system and a Prince George's County jury will hold a nursing home accountable if the facility does not make the settlement offer that justice demands. Call our nursing home lawyers at Miller & Zois today at 800-553-8082 or get a FREE no obligation case review. Get an inside look at every Maryland nursing home. We deep dive the statistics like we did for Hillhaven with every Maryland nursing home. The number of nursing home falls in this country is mind blowing. Call our nursing home attorneys todayat 1.800.553.8082 or get a FREE confidential and online case evaluation. Our caring elder care lawyers will dig through your options and help you chart the path to maximize the trial or settlement value of your case.